In the aftermath of the Great East Japan Earthquake, Masayoshi Son laid out a new energy plan for the future, setting up a foundation to conduct research into renewables, and at the same time expanding the boundaries of his corporation to the global scale. It is hard to find anyone in business circles in Japan, and indeed in the world, who are as capable of generating a buzz and garnering interest as Mr. Son. It is easy to criticize and be a naysayer, but I wonder how those same critics will fare in the face of similarly fierce put-downs. Son-san has not taken long in acting to make his new energy plan, a response to the Fukushima Daichi Nuclear Accident, a reality. On 9th September, I was invited to take part in a panel discussion as part of a conference organized by his foundation. You can view the panel discussion through this link to the foundation’s website, as well as comment or ask questions. The speeches of Kåberger, Dr. Lovins (at around 14 min) and Son (at around 43 min, as well as from the beginning in the second video) were all wonderful, inspring and informative. I was particularly impressed by the comprehensiveness of Son’s vision, his thoughts and views, and his ability to translate thought into action, as well as the structure of his talk. His answers to questions were also very good. If you see his video, you will be able to understand the precarious position that Japan is in, as it is left behind in the wake of of world-movers like the US and China who change the world that we live in through their decisions and the policies that they make. It really saddens me that the people who are in charge of energy policy in Japan, and are therefore responsible for the future of Japan, are too small-minded to participate in global debates, content instead with just looking as the rest of the world seeks change. There is a lot of potential for new enrgineering and technologies within Japan, but so long as they are not utilized and, they will remain as they are, only potential dreams. The Fukushima Daichi Nuclear Disaster is an accident of proportions that will remain for centuries, yet there appears to be little desire to learn from it, no major movement or indication that a definitive master-plan will be in sight. It seems we will only be getting more of opportunistic politicians and media belonging to the ‘ruling elites and establishments’, and the researchers who support on-going agenda. Perhaps this is all part of the mindset of a ‘remote and isolated Japan’ ? It appears that Japan’s energy policy will remain under Regulatory Capture for the foreseeable future. I had requested my publishers to prepare some copies of my book ‘Regulatory Capture’ to sell here just in front of the cofenerce hall, but the demand was beyond expectations and the book copies were sold out very quickly (in Japanese) thanks to an eager audience. Today, August 23rd, is approximately 6 weeks after submission of the report of the NAIIC, and I, as the “former chairman of the committee”, am continuing my journey to see the heads of the 12 towns and villages ruined by the Fukushima nuclear power plant accident. The purpose of my visit is to express my sympathy, as well as to thank them for their cooperation to our investigation. Everywhere I go, I see the heads and feel the people going through tremendous hardships and difficulties. This trip is the last of my series of visits to Fukushima. I left Tokyo with two of our staffs, joined Ms. Hachisuka, the (former) committee member, at Koriyama station, and climbed into her car which she drove for about an hour to Kawauchi village where we had an appointment with Mr. Endo, the head of the village. Then, we drove for another 2 hours, headed to Aizu-wakamatsu, where the temporary office of Okuma town is placed. We got off from the highway for lunch of Udon noodle, the local speciality, then continued our travel via the local road, viewing the beautiful Inawashiro lake to our left, and also the fields of Soba (buckwheat) flowers. Before going to the Okuma town we had a brief stop at the temporary housings where Ms. Hachisuka also lives, and then went on to see Mr. Watanabe, the head. It was a very, very, hot day but the temporary office had no air conditioners, so the staffs were working busily in the lukewarm rooms with only some breezes coming from the fans that were placed here and there. We had a chance to take several snap shots together. The quake and tsunami destroyed instantly the whole infrastructure and basis of the living of the people and there are yet no future prospects available whatsoever for them. I witnessed the tremendous challenges the head and staffs of the towns and villages are facing which filled me with deep sympathy and sorrows which words cannot describe. I honestly wish that our report will serve as any assistance in turning this circumstance to a better direction as fast as possible. Immediately after arriving at Tokyo station, I headed for a session on NAIIC on the web (in Japanese) produced by the Asahi Weekly magazine. I think we had a series of good and meaningful interactions and it lasted for about 70 minutes. Please take a look and think about it. Now that I have completed my series of visits to all heads of the 12 cities, towns, and villages of Fukushima hit by the 3.11 disaster, I somewhat feel relieved. After leaving Abu Dhabi, I came to Washington DC to give speech and express our appreciation to the board meeting of Project Hope, for their support and cooperation in the restructuring of Tohoku. It was early in the morning when I arrived at Dulles airport, Washington DC, from Dubai. I checked in to the Mandarin Oriental Hotel, prepared myself quickly to join with Dr. Noritake of HGPI and Dr. Fred Garber of Project Hope (Ref.1) to visit Ambassador Fujisaki at the Embassy of Japan. Collaboration with Project Hope and our Impact Japan - HGPE all started with one phone call from Ambassador Fujisaki at Washington DC to my blackberry, shortly after the “3.11” Tohoku disaster, suggesting that we work together. After seeing Ambassador Fujisaki, we went to the National Academy of Sciences, then to Global Knowledge Initiative, an organization which I am part of, located in the AAAS building of the National Academy of Sciences. Project Hope holds board meeting four times each year, and invites guest speakers to two of those meetings. I asked “What sort of people are invited for speech?”, since I knew that Project Hope was a global scale disaster relief health care team – one of the largest in the world. But when they said it was “James Jones recently” , to be honest, I panicked a bit. Mr Jones was the National Security Advisor to President Obama. Condoleezza Rice came to speak, too, they said. There were about 40 people in the room. After having cocktails, we were seated at tables and enjoyed conversation until it was time for dessert, when Dr John Howe introduced me as the guest speaker. I talked for about 20 minutes on topics such as the Tohoku great disaster, activities with Project Hope and Ambassador Fujisaki, Operation Tomodachi, future plans, perspectives of Japan-US relationship, and so on. By the way, this year is the 70th year from the “Pearl Harbor” in December, and is also the 100th anniversary of the planting of the famous cherry trees in Washington DC. At about the same time of the day, a reception for the President of Korea, Mr Lee Mhung-Bak, who was visiting the United States then, was being held at the Mandarin Oriental Hotel banquet room. I saw many Korean people at the lobby gathering from early evening, their faces gleaming with happiness and pride, making long lines in excitement. How wonderful. I understand that President Obama welcomed President Lee with special treatment of State Visit (Ref.1). I envy this energy of Korea admitting that Korea has many of its own problems. In contrast, Japan, the neighbor of Korea, has had six different Prime Ministers in 5 years. It is hard for us to see what the government is up to, and I suspect it is even harder for the government to make any big decisions…. Our Lost Decade continued for more than 20 years now, long ahead of EU or US in this sense. Just a week before, US Japan Council was held at Washington DC. The Keynote Remarks was delivered by the Secretary of State, Ms Hillary Clinton, with many political leaders present, including Daniel Inouye, senior United States senator…. I wonder how the event went. I started the next day early in the morning discussing our collaborative project with CSIS, the meeting we plan to organize in Fukushima in November and other issues to take care of. After finishing these tasks, I headed to the airport. This was a trip around the world – departing Narita on the evening of 8th (sat), staying one night each at luxury hotels in Abu Dhabi and Washington DC, spending 3 nights in airplane, arriving Narita on 13th (thur). I slept well in the plane. In the evening of 10th, I departed Narita for Abu Dhabi on a direct flight by Etihad. The objective of trip is to attend the Global Agenda Council organized by the World Economic Forum. The conference, for your information, was held in Dubai annually for the past three years. I saw many of my Japanese friends also boarded on this flight to Abu Dhabi for this meeting. After arriving at Abu Dhabi early in the morning I checked in to the YAS Hotel, the venue, which is also the scheduled venue for the Formula One Car Race (Ref.1, 2) in November. The Car Race was being held at Suzuka, Japan from October 7 to 9, too. Anyway, I was amazed to see the strikingly gorgeous facilities of this Hotel. I attended the full two days of the conference at the building standing next to the Hotel. I understand that this place is going to be used for the Formula 1 also. As for the meeting, I was in the session of the “Japan Council” for the whole day as the sub-Chair. Thanks to the nice support of Mr. Takashi Mitachi of the Boston Consulting Group and many others, we managed to facilitate good discussions. The problem was that there was not much information available from Japan after the “3.11” Disaster (not to mention that six Prime ministers changed within these five years….) thus offering issues for discussion was not easy, and we had to think hard in order to share views with each other. However, I am thankful that we had nice constructive discussions with many people. The reception was at the Royal Tower of the Race Track. It had a nice view over the straight course of the car race. Many political leaders including the Prime Minster of UAE were present, too. After attending the full schedule of the 2nd day, I took a car to Dubai, and boarded on a midnight flight to Washington DC. It was a very full, busy two days. After enjoying Paris for two days in the beautiful autumn weather, I returned to Japan at Kansai airport in the morning of Monday, October 2nd, to head for Kyoto where STS Forum (Ref.1) will be held for three days. I have been participating this Forum since the 1st meeting, and therefore have enjoyed the expansion of networks with wonderful people of the world. I am now acquainted with a number of extraordinary people. This year’s Forum had special sessions in the beginning dealing with energy policies, nuclear power and such because of the Fukushima disaster. I was seated next to Mr. Amano, Director General of the IAEA, at dinner, so had the privilege of talking with him in person on many topics. Many sessions were held simultaneously, so I chose to participate mainly in sessions on education. I also participated as one of the panelists in the session on the change in human behavior (in energy consumption, obesity, etc.) chaired by Philip Campbell, Editor-in-chief of “Nature". On 4th, I returned to Tokyo to have dinner with several political leaders. In the next morning, I had a breakfast meeting with people related to the American Hospital in Paris, and hosted in the entire afternoon a panel organized by JETRO. Here, the panelists consisted of six people who participated in the STS Forum; Ellis Rubinstein (YNAS、President)、Mohammad Hassan (TWAS,Treasurer), Risalia Arteaga （former President of Equador, female）、Dr Annette Lraegelou (Leibniz Institute of New Materials, female), Ananda Chakrabarty (Univ Illinois), and Sanwen Huang (Chinese Academy of Agricultural Sciences). Joined to the conference include quite a number of people from METI, NEDO, and JETRO. We all participated in a good exciting discussion. I always enjoy discussions with friends from all parts of the world. I learn a lot from them, too. I have been busy these days, which is nothing new….. And since my blog postings can not catch up with my real time activities, I would like to post here a summary of my recent activities. From Sydney, I moved to Singapore. Here, I visited several public institutions such as Temasek, National Research Foundation, EDB (Economic Development Board), A*STAR, and SPRING with my friends from Japan to promote mutual connections. Arrangement of appointments with these institutions went quite smoothly because I have been in touch with them for many years as you will see if you search this web site by the key word “Singapore”. Besides these visits, I also spent some time in Singapore with several private entrepreneurs or companies at meetings or meals. Anyway, my impression here was that they are quick in understanding our points, very positive, fast in taking actions, so much that we started worrying about whether we can catch up with their speed in follow ups. In this period of great transformation, nothing matters more than mutual personal trust, networks, and speed for action. I had dinner with professor Ito (which is a regular event in Singapore) of A*star together with Dr. Shigeki Sugii (in Japanese), Assistant Professor at the National University of Singapore from this year after earning a PhD degree at Darthmouth University, and completing Postdoctoral research at UCSD. I also had meals with several people including Ms Tan Siok Sun, the daughter in law of Goh Keng Swee, major figure with Lee Kuan Yew in the founding of Singapore. On 10th, I went to Hiroshima to attend a meeting which was originally scheduled in March by Dr. Yorioka, my long time friend, a nephrologist who retired from the position of the Professor of Faculty of Medicine, University of Hiroshima this spring. The gathering was postponed because of the great disaster. I gave a speech for about an hour. Recently, I focus my speech on “Age of Uncertainty” because we are now living in the age of global transformation. This theme, I believe, is relevant to everyone regardless of boundaries, especially to those who are working in the field of education. I spent a great time here and enjoyed reunions with many old friends. The next day, on Sunday, September 11th, I saw Dr. Azimi (Ref.1), former Director of UNITAR. It has been a long time since I saw him before, and there were so many things to talk about, but unfortunately we ran out of time, and I had to leave for Tokyo. The day was precisely the 10th year of the “9.11”. The whole world remembered this day, and I think every each one of us, in memory of this tragedy that took place 10 years ago, strongly felt how drastically our world has changed since. And it happens that this was also my birthday. I went to the same restaurant as 10 years ago with my family. I received so many Happy Birthday e-mails and stayed up until midnight sending reply to all messages. On Monday, the 12th, I attended the International Conference for the launching of “Japan Renewable Energy Foundation (自然エネルギー財団)“. This foundation was founded by Masayoshi Son of Soft Bank. Multiple resources show that his keynote lecture (Ref.1) was well accepted. The program was nice with many guests from overseas. This conference will continue for 3 days. In the late afternoon, I gave a lecture at a gathering of business persons hosted by Kanazawa Institute of Technology . My topic here was again “Age of Uncertainly”. I used the same title as at Hiroshima, and talked basically the same things although I changed the outline a bit. The huge hall was filled with quite a number of people. I think my speech was welcomed by business persons, and especially people at the Kanazawa University, the host of this event. Since I knew that Kanazawa University has enrollment of over 1000 students per grade, its employment rate exceeding 95%, which means that it holds a high position in the employment rate rankings (though there are a variety of this sort of rankings…. ), one research showed that Kanazawa University scored 9th in the national level, so I made some comments on the background of this fact, what it means, and what the issues of the companies are. During this couple of weeks, I have been busier than ever before, seeing lots of people, attending many events, so many things tend to fall behind. The “Asian Youth Exchange Program in Okinawa” (Ref.1,2) was launched 3 years ago in Okinawa. It is a “Summer Camp” designed for youths of 15 years old or so of Japan and other Asian countries to spend time together in Okinawa for about 3 weeks. The participants truly share a great time together. This year is the 4th year of this program. The title was modified to “Asia Youth Development Program in Okinawa (AYDPO) ” as Okinawa has become the organizer to serve as the host of the program,. All the participants of the last 3 years of 2008-2010 and the university students who joined as the Tutors have been stayed connected through FaceBook and other networks, their passion and friendships remain vividly alive. As always, I went to Okinawa to join in the closing ceremony. This year the students continued to work on water problem. Each presentation was unique and creative in its own ways. We all shared a very moving time. The programs, diary, photos, works, and the songs they made this year are uploaded on this site. Here, you can feel the happy time those youths had together. Their shared experience will be of great value for their future. I encourage all of you to expand such activities spontaneously in anyway possible, whether in schools, communities, or any sort of units as you think fit. It is so important for Japan, Asian youths, and the future of the world to provide youths much opportunities and places to meet each other so that they can create networks of friends beyond the national borders. I firmly believe that this is a great issue. Besides giving a speech at the closing ceremony of AYEPO, I took advantage of this opportunity to visit the Ryukyu University in the morning to join in the lecture and chat with people who are actively engaged in “MOT” (but unfortunately we ran short of time. Sorry about this.) In the evening I had a dinner with President Dorfan (Ref.1) of Okinawa Institute of Science and Technology (OIST) (Dr. Dorfan will be officially appointed as the president of this institution after it is accredited a graduate school), his wife, and　Dr. Baughman, the Vice President and Executive Director. Actions to “Open” Japan to the world are in progress in Okinawa. I ask you all for your warm support. I had the honor of being appointed eight years ago to the Presidency of the Pacific Science Association (PSA) and we held the 2007 Pacific Science Congress in Okinawa and then the 2009 Inter-Congress in Tahiti (Ref 1, 2, 3). I have already, as you may know, talked about these gatherings on this site. 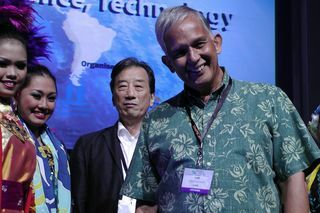 The Pacific Science Congress also has a committee within the Japan Science Council and belongs to the International Council of Science (ICSU). This organization has a long and illustrious history of 98 years. 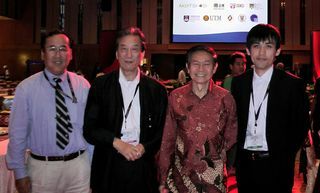 The Congress was held this year in Kuala Lumpur from June 14th to June 17th, and as the Immediate Past-President, I was invited to give a Keynote address. I departed on the 13th for Kuala Lumpur. Malaysia is a country that is vibrant and growing and it is pouring its energies into policies designed to promote education along with scientific and technological innovation. Many local researchers who receive backing from the government were in attendance at the conference making for a really excellent gathering. The title of my Keynote address was “Age of Uncertainty: Have We Become Wiser?” and my objective was to be as stimulating and thought provoking as possible. Of course, many in the audience also expressed their support, concern and condolences regarding the recent tsunami and the subsequent events in Fukushima. Everyone present seemed to find my address interesting and it prompted numerous questions from the audience. The next day I even sat down for a live TV interview that lasted approximately 25 minutes. I was pleased to find out that Greg-san from Nagasaki University observed on his blog that the spirt in the room during my address heightened. The Japan Science Council’s Hatai Medal was awarded this year to Professor Katsumi Tsukamoto (Ref. 1) for his research on the origin and migration of Pacific eels. Professor Tsukamoto picked up his award in the company of his wife and I want to offer him my heartfelt congratulations on receiving this honor. I also was able to meet up with Dr. Robert Underwood (left photo below) who is the President of the University of Guam and had served in the U.S. House of Representatives from 1993 to 2003. He talked about the far-flung Pacific Islands including the problems they grapple with in the areas of education and health care as well as their unique relationship with the United States from an extremely interesting perspective. He extended an invitation to me to visit Guam and I think that I would like to take him up on his offer sometime within the next year. The Congress was an overall enjoyable experience which allowed me to see many old friends, make some new ones and meet young up-and-coming researchers. I have previously talked about the Global Science and Innovation Advisory Council (GSIAC) which operates under the Malaysian Prime Minister, and I also had the opportunity to meet for around an hour with Dr. Zakri, who is the Prime Minister’s Chief Science Advisor, and his staff. The members were truly an impressive lot and I was honored to be able to participate in this confab. The next Inter-Congress meeting is scheduled to be held two years from now at the University of the South Pacific (Fiji). How about joining us then?? ‘3.11’ disaster attracted global attentions not only by its huge impact but also by the importance Fukushima has in the world. News coverage of Japan is altogether minor in international media. If you follow the world news, it is perfectly clear that any comment by Japanese government is taken as nothing but excuses. ; that is to say the credibility and trust of Japanese government have fallen. Then, how can we recover the international credibility of Japan? This is the keypoint. As far as browsing through the domestic news coverage, I could hardly find any opinions or comments by the Japanese ‘leaders’ on this issue. At a time like this, when the nation is at the brink of losing its trust, it is good to learn lessons from the past. However, that being said, the point is how much the leaders have profound insights, are capable of making good judgments, know what they must do. Self-centered ‘pride’ means nothing here. The one and only thing that matters is how much you care about the people (of Japan). It goes not just for the government but also for the major business enterprises like TEPCO. This means, in case of the Fukushima Nuclear Power Plant, that the government or the Diet must launch an ’International’ task force that is completely ‘independent’ from the government. I can assure you that unless this is done, the world’s trust in Japan will never even start to recover. Such idea/reasoning is also presented in the document which the Natural Resources Defense Council submitted to President Obama dated March 25th. Also, unfavorable rumors or misinformation about agricultural produce or industrial products, thus harming credibility of Japan, are difficult to tone down unless the steps I described above do not materialize. There are lots of lessons to be learned from the process of recovery of the reputation of British Government that took more than 20 years when the BSE started in 1886. What we need is a special committee that is ‘independent’ and ‘outside’ (i.e. internationally trustable) of the government. Equally necessary is a quick and total information disclosure. This again, is very unsatisfactory at this stage. Transparency is the foundation of trust and credibility. Recently, I had an opportunity to present this idea using this figure at a meeting (open to media) organized by legislators of the Democratic Party of Japan. I learned that many members of the Diet share this idea with me (in Japanese). Mind you, the whole world is watching. They are questioning whether Japan has no intention of turning the Fukushima nuclear power plant disaster to lessons to share with the rest of the world. Hardships will continue for the people at Sanriku district, the area hit by the great tsunami disaster. I earnestly hope that political measures will be taken swiftly to at least have their basic daily life recover soon enough although inevitably more time is needed for full recoveries. In addition, we have to deal with the huge nuclear power plant disaster in Fukushima. The whole world is paying attention to us. This issue is not something that will end in a decade or so, but something much huge, that will last for much longer period of time. Since the global trend was to increase the number of nuclear power plants, the attention from the world to Fukushima is accordingly much higher. Here, I would like to introduce to you my interview (in Japanese) with Tetsuo Saito (in Japanese), Deputy Secretary General of the New Komeito, and former Minister of Environment. This interview includes ideas on the ‘most important things to do’ NOW, so please take a look. In the end appears my recommendations on ‘the most important things to do’ at this time. I have been expressing my views repeatedly in this web site, so I think you already understand, but below are some examples for your reference (Ref.1 (in Japanese), 2, 3, 4, 5 (in English)). I have also pointed out that Japan is currently regarded as one of the major risk factors of the world and explained why this is the case.